Even after one year since the launch of an investigation and despite the high public interest, the investigative authorities of Georgia have not yet published information about the progress of the investigation. The suspicions about the participation of Georgian law enforcement authorities in organized crime have not been diminished. May 29, 2018 marked one year after the alleged abduction of Afgan Mukhtarli, exiled Azerbaijani journalist and activist residing in Tbilisi. Even after one year since the launch of an investigation and despite the high public interest, the investigative authorities of Georgia have not yet published information about the progress of the investigation. The suspicions about the participation of Georgian law enforcement authorities in organized crime have not been diminished. Up to now, Afgan Mukhtarli and his wife, Leyla Mustafayeva do not have the status of victims in this criminal case; There was no effective investigation of alleged surveilance on Leyla Mustafayeva and Afgan Mukhtarli’s friend, Dashgin Aghalarli in Tbilisi. Leyla Mustafayeva even presented the photos of her possible followers to the investigators, however, the information about the identification of those persons or other conducted activities are unknown to the interested parties. Despite requests from civil society and media organizations operating in Georgia, the temporary investigative commission has not been created in Parliament of Georgia to examine the alleged abduction of Mukhtarli and his illegal transportation through the border. The alleged abduction of Afgan Mukhtarli and his transfer to the country of his origin violate the rules of international law. Georgia, which is the party of the European Convention of Human Rights, is obliged to ensure the safety of foreign citizens, including citizens of Azerbaijan, or stateless persons in Georgia and prevent their forced transfer to the country of their origin, where they may be subjected to the politically motivated arrest, torture or inhuman treatment. Ineffective investigation of the incident, on the one hand, threatens Georgia’s international image, in terms of human rights standards and respect to the rule of law in the country. On the other hand, it strengthens the doubt about the political influence over the investigation. Until now the society has become aware of the dismissal of the Heads of Counter-Intelligence Department of the State Security Service of Georgia and the Border Patrol Police of the Ministry of Internal Affairs. The alleged abduction of Mukhtarli has resulted in a number of reactions on international level. 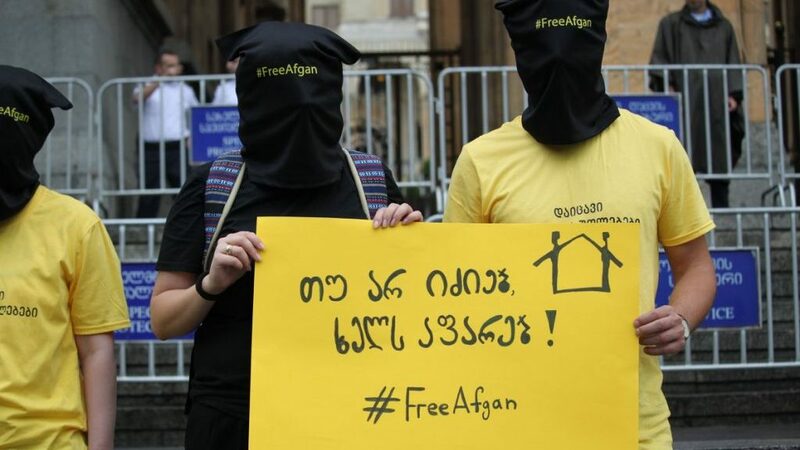 As it is emphasized in the resolution accepted by the European Parliament, “Strongly condemns the abduction of Afgan Mukhtarli in Tbilisi and his subsequent arbitrary detention in Baku; considers this a serious violation of human rights and condemns this grave act of breach of law [and] urges the Georgian authorities to ensure a prompt, thorough, transparent and effective investigation into Afgan Mukhtarli’s forced disappearance in Georgia and illegal transfer to Azerbaijan and to bring the perpetrators to justice;”. “(Georgian) authorities have conducted a quick investigation and denied the involvement of Georgian security service in the incident. Subsequently, due to the increased international and internal criticism, they dismissed several employees of the Counter-Intelligence and Border Police Departments, before the end of investigation” – is mentioned in the report. According to the 2018 report on democracy by the authoritative human rights organization “Freedom House”, Georgia still remains in the list of partialy free countries. In the basic findings of the conclusion the fact of Afgan Mukhtarli’s disappearance from Tbilisi was mentioned as one of the most important cases. His reappearence in the authoritarian regime’s borders is mentioned as “the most alarming threat to democracy”: “Exiled Azerbaijani journalist Afgan Mukhtarli was kidnapped in Tbilisi by men who allegedly spoke Georgian, then transported across the border to Azerbaijan, raising concerns that Georgian authorities were complicit in the abduction.” – the report says. Why number of video-recordings that could reflect the transportation of Afgan Mukhtarli from Tbilisi to Lagodekhi border crossing point are not used in the investigaiton as the evidence. Why Afgan Makhtarli and his wife do not have the status of victims in the given criminal case. Considering that the investigation of the criminal case has begun and proceeded with significant shortcomings, Parliament of Georgia must establish a parliamentary investigative commission that will investigate the alleged abduction of Afgan Mukhtarli, as well as the investigative process and its consequences. “Human Rights House” and its member organization “Article 42 of the Constitution” protect the interests of Afgan Mukhtarli at the national level and the European Court of Human Rights. Azerbaijani journalist, Afgan Mukhtarli, disappeared on May 29, 2017 in Tbilisi; Later he was found detained in Baku, Azerbaijan. According to his testimony, he was abducted by people who were spekaing Georgian and were dressed in Georgian police uniforms. In Azerbaijan, Afgan Mukhtarli was charged for illegal crossing of the border, smuggling and resisting to the border guards. On April 24, 2018, the Sheki (Azerbaijan) Court of Appeals left the decision of Belakani District Court unchanged and sentenced Afgan Makhtarli to six years of imprisonment. According to Afgan Mukhtarli’s lawyers, the accusations against him were not supported by any evidence and during the consideration of the case in Georgia his right to fair trial was violated. Prior to the final proceedings in the Court of Appeals, according to the request from the Prosecutor’s Office of Azerbaijan, Azerbaijani Bar Association has terminated the license to practice law to Mukhtarli’s attorney, Nemat Kerimli.